Summary: What if you had only one day to live? What would you do? Who would you kiss? And how far would you go to save your own life? Samantha Kingston has it all—looks, popularity, the perfect boyfriend. Friday, February 12th should be just another day in her charmed life. Instead, it’s her last. The catch: Samantha still wakes up the next morning. In fact, she re-lives the last day of her life seven times, until she realizes that by making even the slightest changes, she may hold more power than she had ever imagined. Yay Please count me in! Please enter me I would love to win and read Before I Fall! Enter me please :) I've heard great things about this book. I realy want to read this book! I love the cover and everybody say good things about it! I can't wait to read it! thanks fot hosting the contest! Please count me in! I've hear great things about it everywhere!! sign me up please! thanks! Oooh please enter me! I've heard amazing things about Before I Fall. i would love to enter thankyoooouuu!!! Please include me! 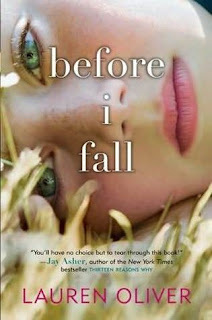 I want want want to read Before I Fall! I've heard wonderful things about this book. Count me in please. Please count me in too. Thank you! Sugoi (awesome) !!! Please enter me, thanks for hosting the contest. Me, me me! Please include me. This is really a different contest. Please enter me, I am from South Africa. a contest but international only, so cool! i would love to enter it! I want to read this one badly! Great book to win ! I'd love to win this one. Please count me in. oh, thanks so much - please count me in!!! W00t! thanks for making this one especially for us internationals. I'd like to enter, please! Another book on my TBR list! Id love to win it!! I would love to be entered also!!! How cool, I've never seen an exclusively international contest. Count me in! Please enter me! And thanks for opening it internationally! I'll post a link on my blog tomorrow too! Please enter me to this one! I'd love to enter! Thanks! I would love to win this book! Please count me in! This is a fantastic contest! Count me in! Thanks for the international contest. such a great book! Please enter me!